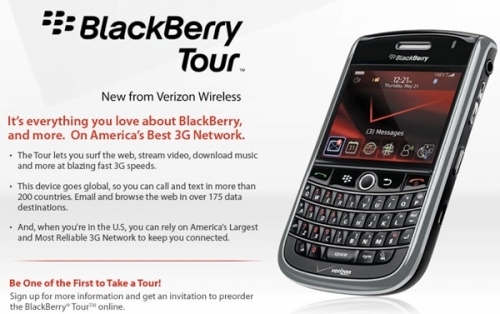 BlackBerry Tour coming to Verizon and Sprint | BlackBerry Blast! The BlackBerry Tour is finally getting its official on. Verizon has unveiled a teaser page for the new BlackBerry (check the link below). There's not a lot of information on the page, but you can see an official picture and sign up for a newsletter. Sprint has also signaled they will offer the BB Tour 9630. Sprint will offer $150 in rebates which will bring the price to $199, with a two-year contract. Expect Sprint's version to be released sometime later this summer.